This one key search term is the best kept online shopping secret to scoring big discounts at 40, 50, even 80% off already marked down prices. This post contains affiliate links to sources I personally trust and use myself. Thank you for helping to keep this blog running. For more information, see my full disclosure here. Can I tell you a little secret? One that I probably haven’t mentioned before? Something that, if you met me face-to-face, you would never ever guess I have a weakness for? I’m a bonafide rollercoaster junkie. There, I said it. On any normal day, I’m a play-it-safe and follow-the-rules kind of girl, but until the other day, riding high speed rollercoasters 10 times in a row was the only time I ever really craved living on the edge. If you’ve never heard of shopping “as is” but are pulled to store clearance aisles like a magnet, this one will blow. your. mind! 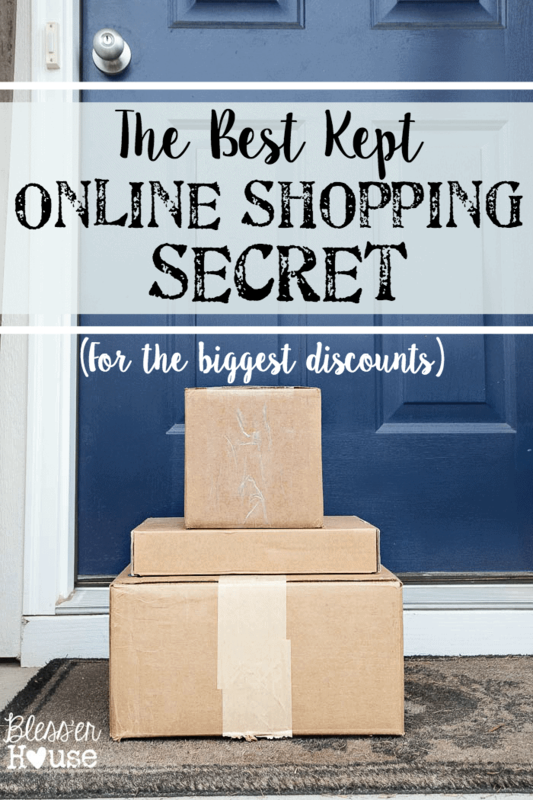 And unlike a lot of other high discount online shopping, this one isn’t gimmicky. I’ve only recently discovered this trick, and I’ve only found it so far on Overstock, but I’m sure there are similar searches out there on other retail sites. All you have to do is type “as is” (without quotes) in the search bar, and hundreds of items show up that are marked down at a discount- 40, 50, even 80% off the already discounted stuff. An industrial metal and wood barstool for $67.50. 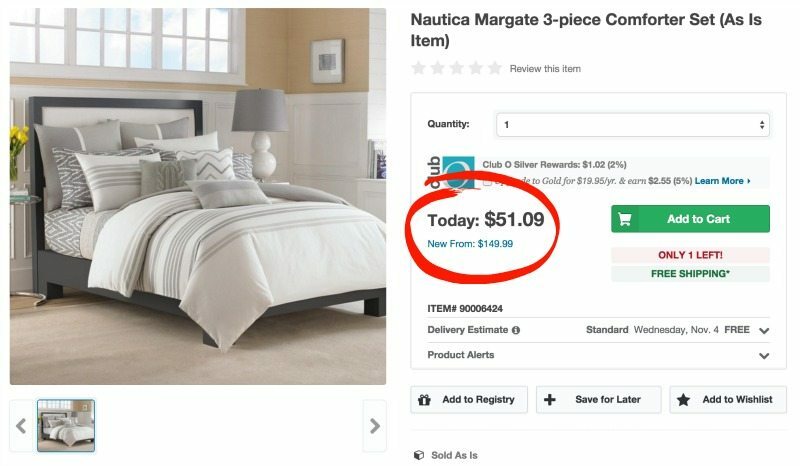 A Nautica comforter set for $51.09. 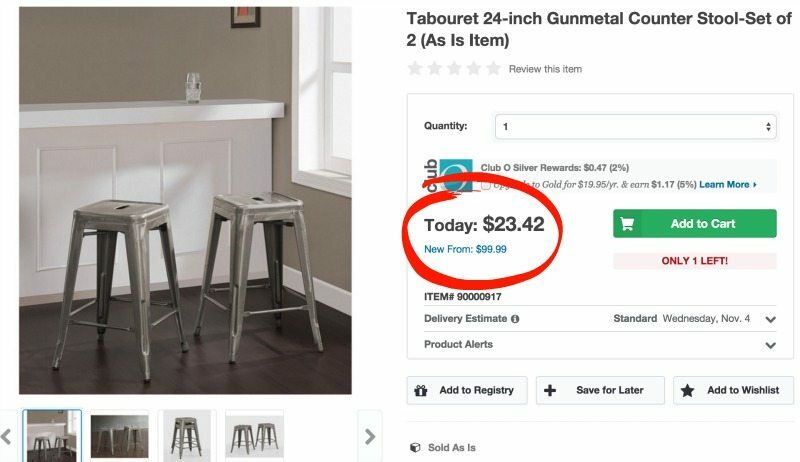 These metal counter stools for $12 each! 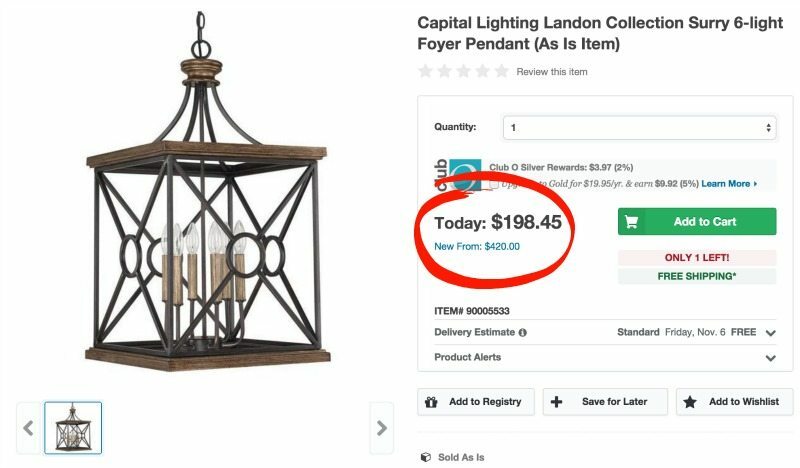 And even though this pendant light would still be a splurge for me, it’s gorgeous and marked at over 50% off. 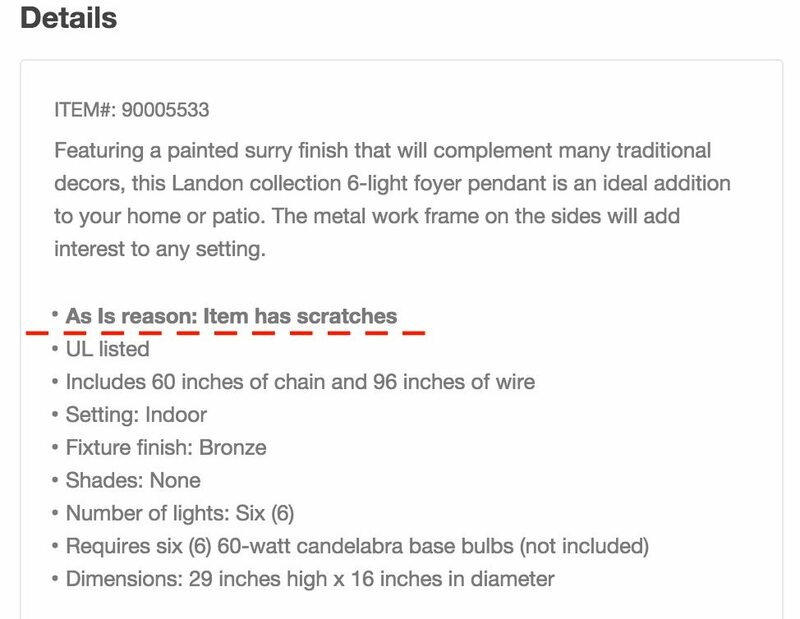 But Overstock does explain the “as is” reason in the product details, so you’re not totally flying blind. The downside is the sales are final, so it can’t be returned- a bit of a gamble. But chances are the flaws are fixable. 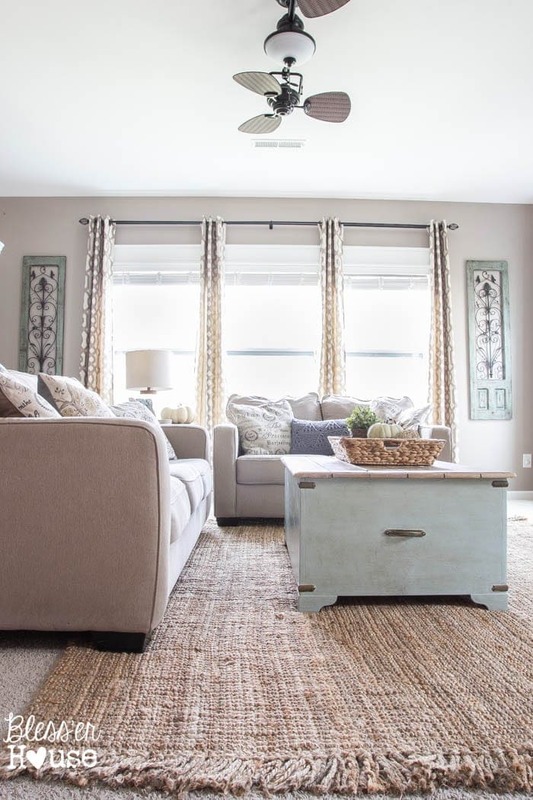 I’d already mentioned back in the final stages of Olivia’s bedroom makeover that Overstock is my top source to buying area rugs at a discount. For so long, I wanted an area rug for our living room because it just didn’t seem quite finished without it. Then, ta da! 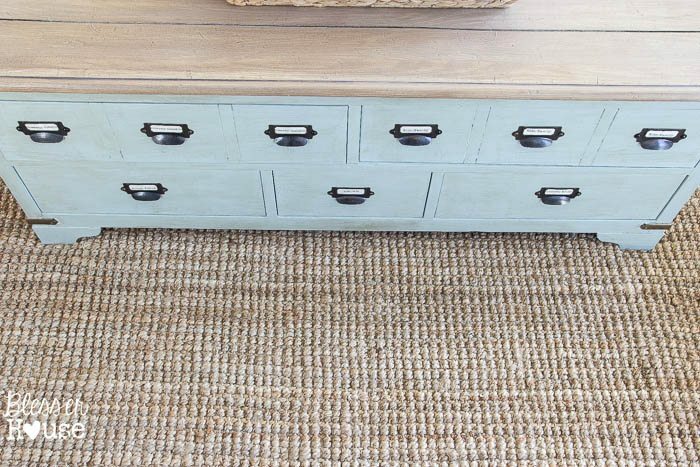 I found this 8×10 jute rug that I’d had my eye on for a year in the “as is” search marked down to $128 from $239. The “as is” reason listed on the site said the rug had a smell. Honestly, I was nervous hitting that buy button. And the whole 4 days it took to arrive, I kept wondering if I’d made a huge mistake to end up with a janky smelling rug. When it showed up at my doorstep, I ripped that plastic open, and took a huge whiff. And I probably looked like the craziest woman alive, sniffing her new rug on her front porch. But y’all! It didn’t smell AT ALL! Maybe I just got really really lucky, but I was dancing, literally dancing. I’ll definitely be checking in on the “as is” search a lot… ya know along with my regular Craigslist and thrift store browsing. And I figure, if I ever buy a rug that is fraying at the corner, I can always sew it back up or tuck it under a piece of furniture. If a piece has a scratch, I can most likely polish it out and touch it up. Regardless, our living room is feeling a wee bit cozier! And now I want one of these rugs everywhere. It feels like a foot massage every time I step on it. Are you a rollercoaster loving, live-on-the-edge kinda gal too? Have you ever shopped “as is” before? Or know of any other retail sites where you can shop returned items? Maybe you shouldn’t tell me because that might be bad for our bank account. 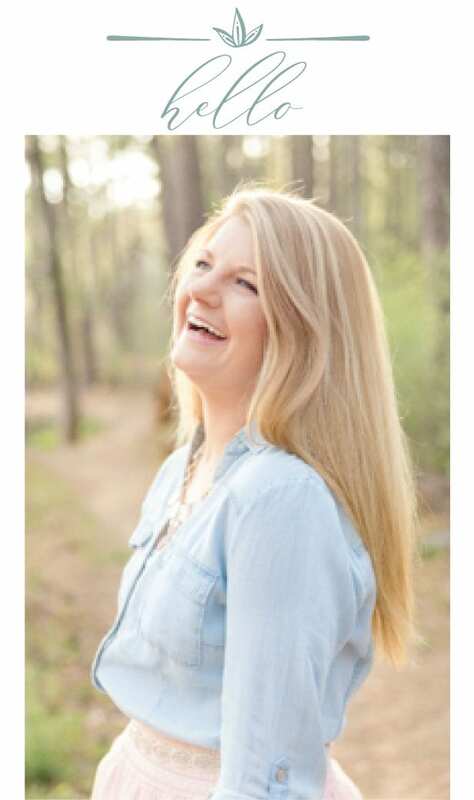 You have the best bargain hunting tips, Lauren! I had no clue this was even an option. I found out about Amazon Warehouse Deals by accident. I was buying Marcal recycled chlorine free toilet paper. And there was one listed under USED. I laughed…USED toilet paper?! That is how they list their stuff with damaged packaging. WOOO HOOO for me! It was so much cheaper. I just ordered a paint sprayer tip and extension (for doing the ceiling) For my Graco sprayer from Warehouse Deals yesterday. I saved $15.07 and $10.50 I LOVE IT! I just went on Overstock and bought 2 AS IS 26″ pillow forms and a “knee” pillow for sleeping and spent $31.51 and that included the $4.95 shipping! Thank you for sharing!!! YEAH!!! That’s awesome! So glad it helped, Robin! Haha! I just died over the “used toilet paper” bit. Hahaha! No, Amazon, you can keep your toilet paper. Thanks. But yes! I’ve tried out Amazon Warehouse Deals too and they’re awesome!! Wish my Goodwill had dollar shopping. I’m so jealous! I’ve purchased “As Is” items from QVC online. Their “As Is” items are stated to be items that have been returned for any # of various reasons or possibly an item that was used in an On Air presentation/demonstration &/or not in its original packaging. Their “As Is” items ARE returnable if you’re not satisfied. I’ve never been disappointed with any “As Is” purchases I’ve made from QVC. Good to know! I’ll look into that one! Thanks! Love your site, Lauren. 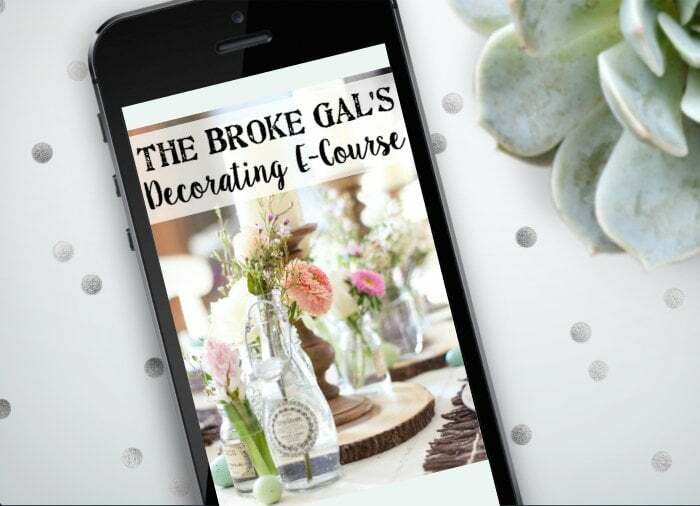 Since I have an in-home business that keeps me busy, I order as much as I can online. I mean everything! It’s amazing what you begin to learn the longer you’re at it, too. The news keeps reporting big stores like Macy’s and Kohls are reducing the number of stores like Barnes & Noble did years ago. Their customers are online now. Free shipping and ease of shopping are two big reasons. Regarding area rugs, I was in the process of moving into a new house and began looking at rugs about a year ago. There are many so-called discount rug sites online. But it pays to look at the high end retailers online, too. They have great sales. In the fall, they all began having sales. Black Friday. Online Monday. All the retail holidays, they’re having huge sales, as well. They clean out their inventory for new stock. I found many of the rugs I’d wanted but were over $500 to $1,000 each, dropped to below $300. Some to $150! Be patient and look around. Get to know the brands and the rug style name and google it. The online retailers are very competitive. And always look for free shipping. I rarely buy anything without it! This system works for virtually everything. WHAT?!?!?! 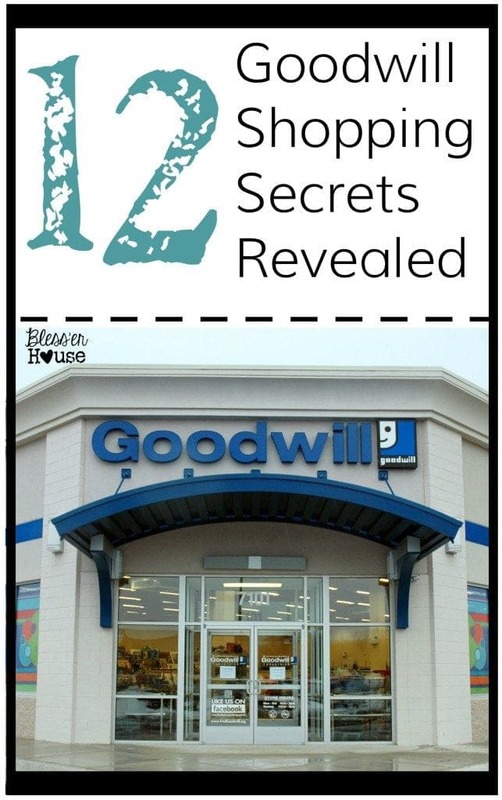 This is a total shopping game changer! Thank you so much for sharing your secrets, Lauren! Now I’m off to search for ALL OF THE “AS IS” THINGS! Isn’t it awesome!? Hope you find something good! Where did you get that teal coffee table!? I’m obsessed!! II have been crushing on that coffee table since I first saw it. I don’t see anything that great on Craigslist but I will not stop looking! It is exactly what I need. I need to hide all my “stuff” but I need it handy. Question for ya….did that coffee table have ANY info whatsoever on it underneath or inside? Cuz I am tellin ya it is PERFECT for what I wanna have in my house and if I had a clue to the maker I could look for one similar to it. This is the greatest thing ever! Thank you so much for sharing! Great advice! 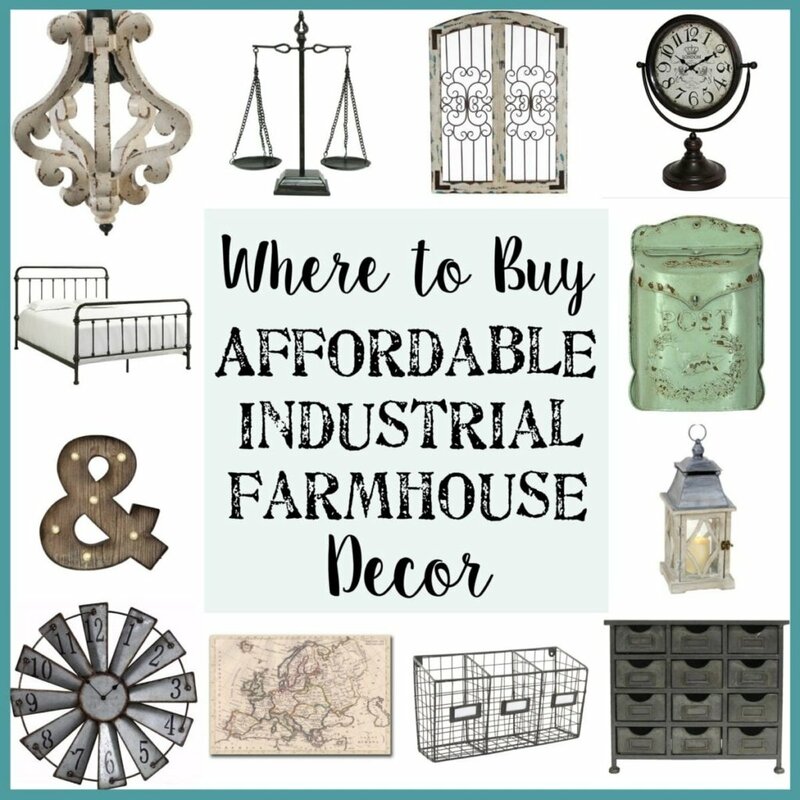 I’m a clearance rack shopper myself, and am currently trying to decorate our new house on a budget. The rug is fantastic, and your room is beautiful! I agree! I love the texture they add. Okay, so you’re going to laugh. But I just rolled my pant legs up and crawled around on my rug for a minute to check. Haha! It is surprisingly comfortable. I would have been nervous about that when my daughter was a baby too, but now that I’m feeling it in person, I think it’s soft enough for a baby. We’ll probably have another little one one day, and I plan on still having this rug. Thanks for the shopping tip about “as is”….hadn’t thought of that before, but will definitely be on the lookout. And I LOVE your new rug and how it really completes an already great space! Thanks for sharing….. Thanks, Lanita! I was so excited when I found it. Holy moly this is an awesome tip! I’ve got yard sale money burning a hole in my wallet so I’m going to check this out ASAP! Thank you for sharing! Woohoo! Glad it helped! And yay for yard sale money! That’s always a good day. Game. Changer. Thank you so much for this tip! And I’m sure you’ve covered this before, but where is your coffee table from? I LOVE it!! This is by far the best shopping advice I have ever heard off. Like totally mind blown!!! I really really have to contain myself to not jump on overstock right now but to wait for the little ones bedtime. Thank you so much for sharing!!! Thank you for sharing this, Lauren! I love deals and saving money; and I REALLY love your new rug. I had to chuckle about the sniff test, but I would have done the same. Haha! I probably looked like a total lunatic. Glad it helped, Carol! Oh my! I am so going to do this!! I am a big bargain hunter and never knew this was a thing. Thanks so much for sharing this tip! I just got that same rug, but in a runner for my entry way and love it! Thanks for the reminder! I used to visit O and had forgotten lately. I think I feel some online shopping coming on!! This is going to forever change my shopping habits! I am so excited about this secret and I cannot wait to try it out. Thanks for sharing! Isn’t it awesome! Total game changer. Let me know if you try it out! I’d love to know others’ experiences. Hi Lauren, you just crushed my world and then built it back up again! Here I thought I was this super savvy shopper, knew all the ins and outs, had nothing else to learn…and then…you hit me with the ‘as is’ strategy. Now I’m really excited to give it a try! Haha! Well, I hope you find something really really awesome. I’d love to know how it turns out if you ever try it! Wow, I had no idea as is stuff existed online! Thanks for the tip. We’ve been looking for a few new area rugs, but the prices always scare us away. Maybe I can find one at Overstock! I didn’t either until very recently! It was too good to keep to myself. 🙂 Area rug prices are definitely hard to swallow. After reading this post, someone else also ordered an area rug and she told me it had the as is description “dirty/dirt on rug”. When she received it, she said it was completely perfect and not dirty at all! So that was good to know someone else has a great experience with it. I look forward to reading more of your post!! Yay!!! Total game changer, right? One question maybe you could answer: When you see something that should have a specific size that you need (boots, bedding sweaters etc…) how do you know what size or color you will be getting? Or can you select a certain size or color? Hmm…usually it says in the title of the listing what size or color it is since it’s only 1 individual item. I’m pretty sure anyway. Love this! 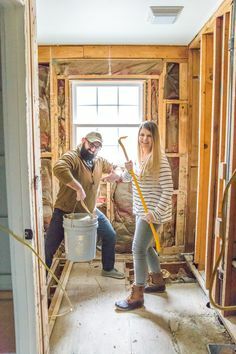 What is the wall color?? 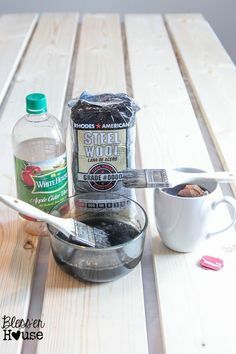 I just found your blog via Pinterest, I love your style! Thanks for the awesome tip! Also, I just have to ask.. Where is your amazing coffee table from? I’m in love with it! Where are the couches from. I love this style living room. Not seeing where your coffee table came from? Or was it a Goodwill or flee market find? Where did you find you sofa and love seat? We bought them at Ashley Furniture Homestore a couple years ago. 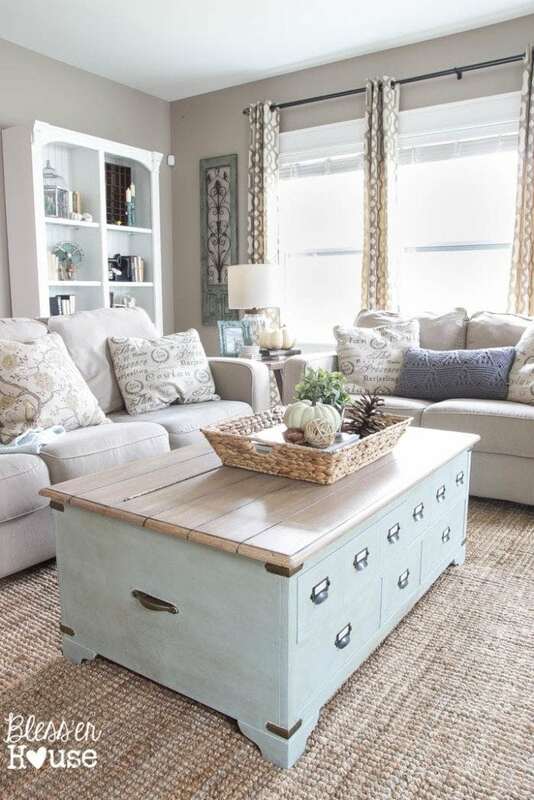 I love this coffee table in the pics. Where did you find it or did you make it? Awesome!!! So glad it worked out for you, Teressa! I have to remind myself to pop back over there with the As Is search. It constantly changes every day. I absolutely love your living room! We are in the process of buying a house and will be needing to paint. I’m loving your wall color. Would you happen to remember the ncolor ame and brand of it? Thanks! Thanks, Ashley! Absolutely! The color is Sherwin Williams Perfect Greige. In the daylight it looks more gray but in the evenings, it takes on a beige tone. I have been searching for rugs for my 2nd home I’ve been re-doing. It is a combo French-shabby-cottage. (Very girly)? So, this week on OS they had a rug I have been looking at in the “as is” with no discription of return reason. I write them and asked. They reply was the rug doesn’t lay flat. So I’m undecided. What do you think? Oh yay! If it were me, I’d go for it. 😉 You could try rolling the rug the other direction to see if that would flatten it. Sometimes I have to do that with rugs and it usually works. Or if it’s going in a living room or bedroom, having furniture on it could help. The “As is” rug arrived. I don’t know if it was the 110 degrees outside on the front porch for a few hours, but when I drug it in and unrolled it, the one place where I think it didn’t lay flat straightened right out. So a rug I had been watching on many online stores was now purchased for less than half price. It smells of new carpet too. :) Thanks for the good shopping tip! YAAAAAAY! “As is” shopping for the win! I’m so glad it worked out for you, Kathy! 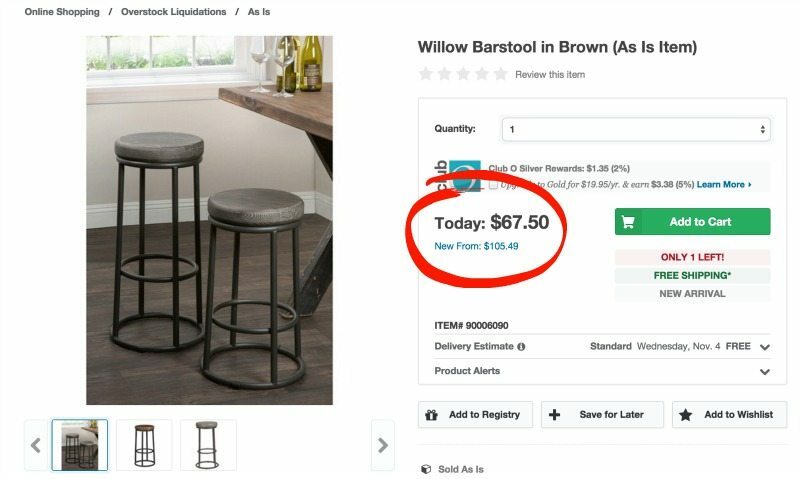 I clicked on your link to see if it said where you bought your coffee table but I was pleasantly surprised with your tip on how to save even more! I am extremely frugal and I can’t wait to try this new discovered tip! Thanks!! Also, do you remember where you bought your coffee table?!? It is GORGEOUS!! Where are your sofa and love seat from? We got them at Ashley Furniture a couple of years ago. It’s from the Alenya collection. Where did you get the coffee table with the drawers? wood on top and light blue on bottom….I LOVE it! Thanks for the great information. BTW – I love your coffee table. Where did you find it? 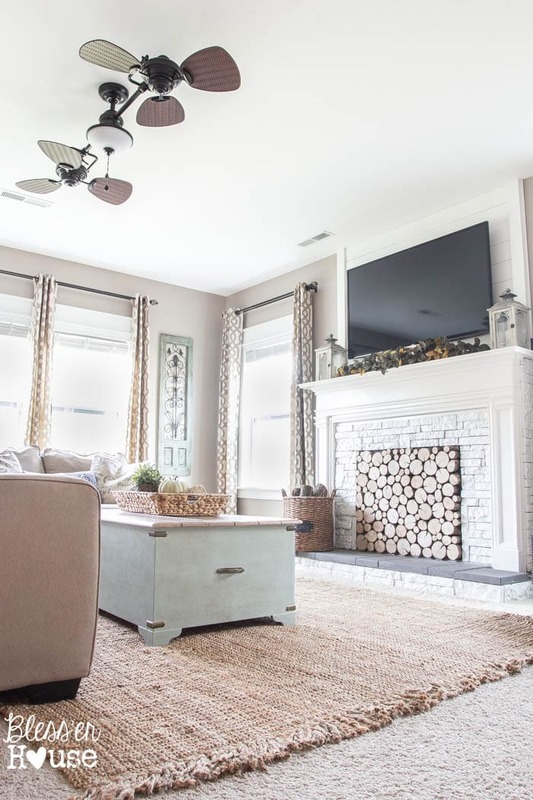 I love the coffee table in the images of the living room my internal interior decorator is screaming to get its hands on it…… Where can I get it? Is it available anywhere? Where did you find that awesome truck coffee table?! In love??? I love the rug in your den! And it’s on sale at overstock for $184 now! I’ve been wanting a rug for our den because it feels unfinished, but I haven’t been sure if it would lay flat on carpet with our couch and coffee table on it. Does yours buckle or bunch up? Would love your thoughts! Thanks so much! Yay! That’s awesome! We have had no issues at all with it buckling or bunching up. But if you have hardwood floors, that might be a different story. Where did you get your coffee table? I absolutely love it! All of your pillows are the best!!! Where are they from?? Just what I am looking for!!! Thank you for this great information. My husband and I relocated to a new city and state. We bought a new home and your website is giving me so many ideas. I have so much trouble putting things together and visualizing how it will look. I love how you have decorated this room. Where did you get the curtains from? 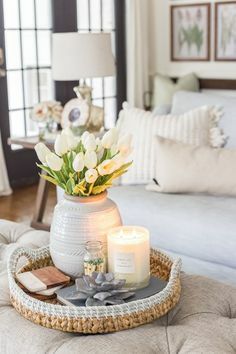 I have been looking and not sure what to get or if I even want to put curtains up because I love the openness of a room. However, the way you have the curtains hung it stills looks open. Thank you, Tammy! I’m so glad my little blog has helped you! I got these taupe print curtains at Kirkland’s. Similar to these: http://fave.co/2d8lET0 I’ve since replaced them with white Ritva curtains from IKEA though, and I love how open they make our living room feel. I got so many things I’ve been shopping for. Let me share this little hint. I use Google Chrome as a browser and it has an add on called “Honey” . Honey finds coupons for wherever you’re shopping (if there are some). Today Honey saved me $20.00 at the Overstock site. Since you’re so nice to share your deals, I thought I would share that one with you. Thanks for such great ideas! Yes! I love using Honey! I use Ebates.com too and it’ll give you cash back when you shop online. Thanks, Suzanne! How did you do your coffee table??? I’m guessing you diy’d it, and I think our coffee table is that exact one, but it is is still brown and has the ugly rings on it. How did you update yours? Where did you get that coffee table????? Love!!! Where are your curtains from & name of them? Hi Chelsea! I got the curtains at Kirkland’s about 3 years ago. I’m not sure if they carry them anymore, but they’re called Taupe Gatehill. We bought them at Ashley Furniture about 3 years ago. They’re from their Alenya collection. Was just wondering if you could tell me where you got your bluish coffee table that is on top of the gorgeous as is rug that you got? 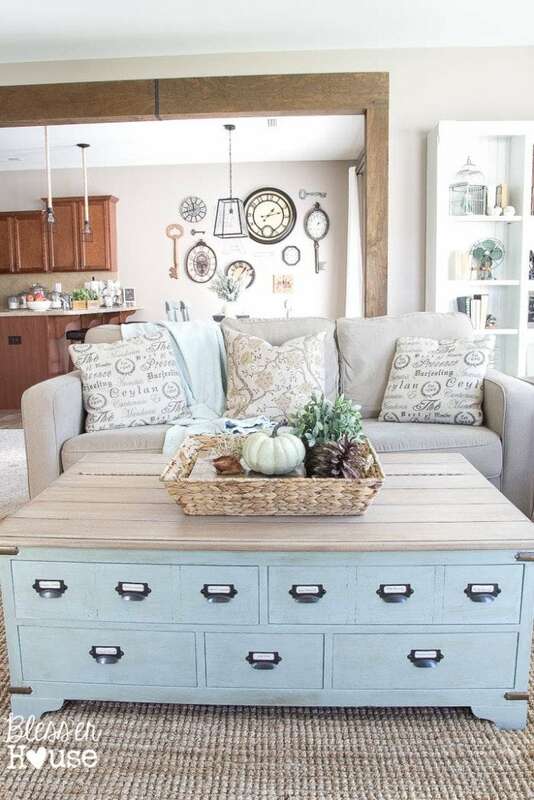 I really like the table and either want to know where to get one or what they are called so I can search to see if I can find one. I love the look! Thanks! I love your blog! I have gotten many ideas from you!! I need this coffee table for my living room, where can I get it?! Ummm…how have I never heard of this?! I shop the scratch & dent section in-store, but did not know I could search for “as is” online. Thank you for sharing this info! 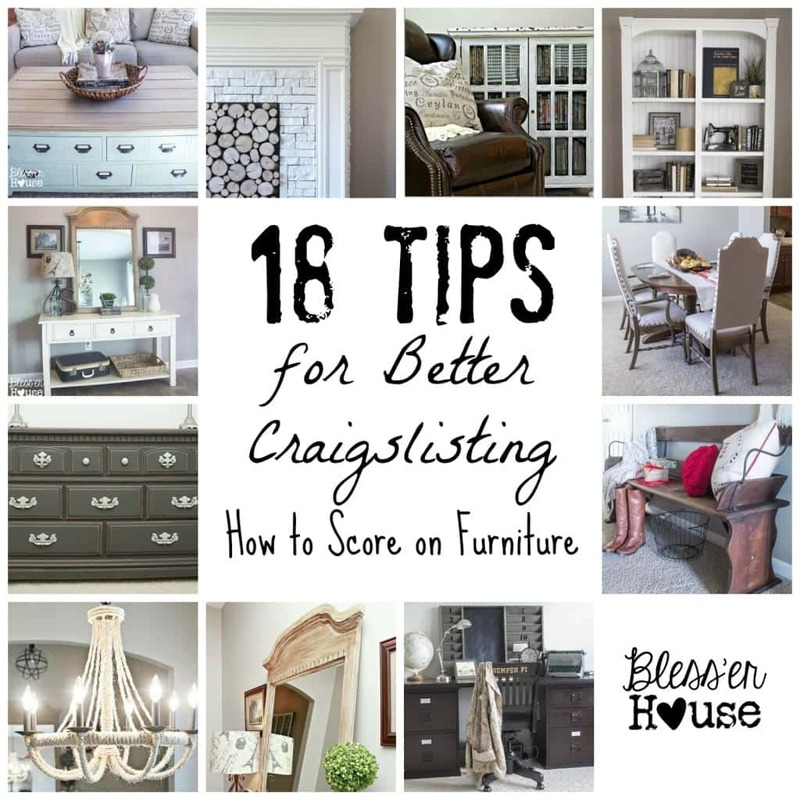 We’re moving from Ak to Az this summer, selling everything we have & starting over, so this is super helpful for whatever I can’t find on Craigslist & thrifting. I also am a rollercoaster junkie (waterslides too). It’s gotta be in my blood or something because my 75-year-old grandma still takes her great grandkids to Knotts & goes on rollercoaster with them, haha. Love your blog. 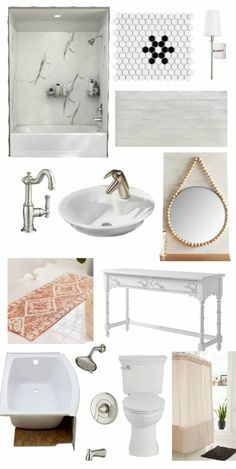 So many times on Pinterest I see something I LOVE and open the link to see it’s from your blog. Definitely one of my favorites. Just happened upon your blog and LOVE it!! 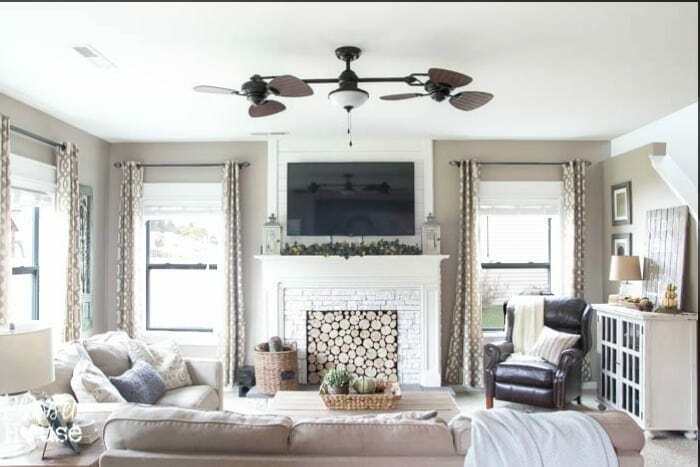 Please tell me where you bought that beautiful double ceiling fan in your family room. I’ve been searching everywhere for one like it! Thanks, Victoria! The fan is from Lowe’s. Where did you get your amazing coffee table? I’m in LOVE with your paint color! Can you please share with me what you used? I searched on your page for a bit but wasn’t able to find it. ?? Hi, I’d also love to know what color paint you used on your walls! I think it would be perfect in my space. Hi, Mike! It’s Sherwin Williams Perfect Greige. When I go to Overstock.com and search for As Is it takes me to clearance, but not to the as is section. Any ideas as to what I am doing wrong? Looks like they totally changed it and the “as is” way to search no longer works. So saaaaaaad!!!! I know this is an old post, but I’m looking at outdoor storage bins and the as is reason states : multiple reasons! That scares me because, are there multiple issues? Such a good deal though, I may have to pull the trigger…any experience with this reason?? No experience with the reason before! But I imagine if they were really bad, they wouldn’t re-sell them at all?